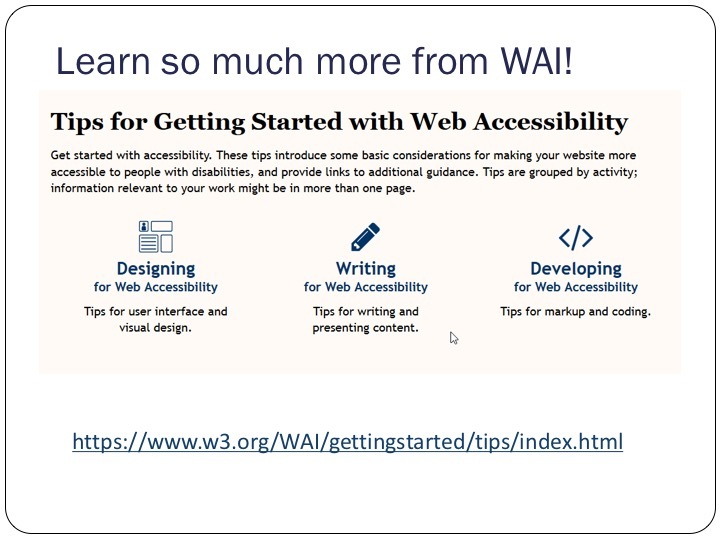 To build a web-based experience that’s approachable and usable by all of your visitors requires that you dive into the world of accessibility. 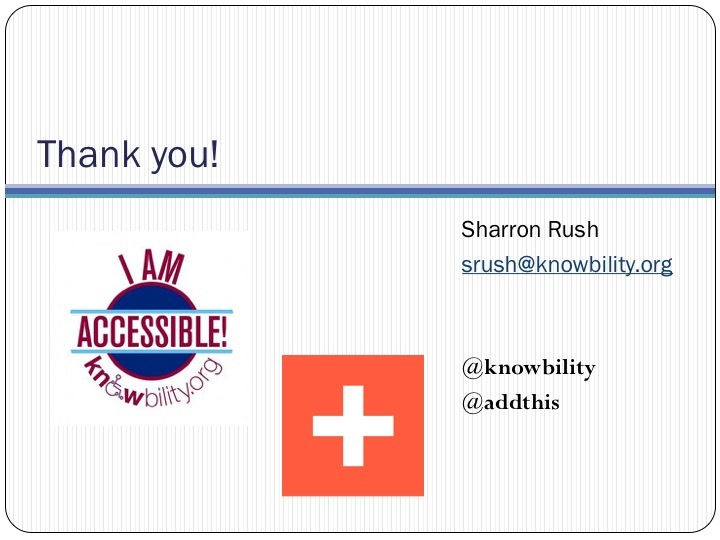 We could think of no better advocate and authority to speak to you than Sharron Rush, co-founder and Executive Director of Knowbility, Inc.
Knowbility, Inc. is a 501(c)(3) nonprofit organization whose mission is to support the independence of children and adults with disabilities by promoting the use and improving the availability of accessible information technology. 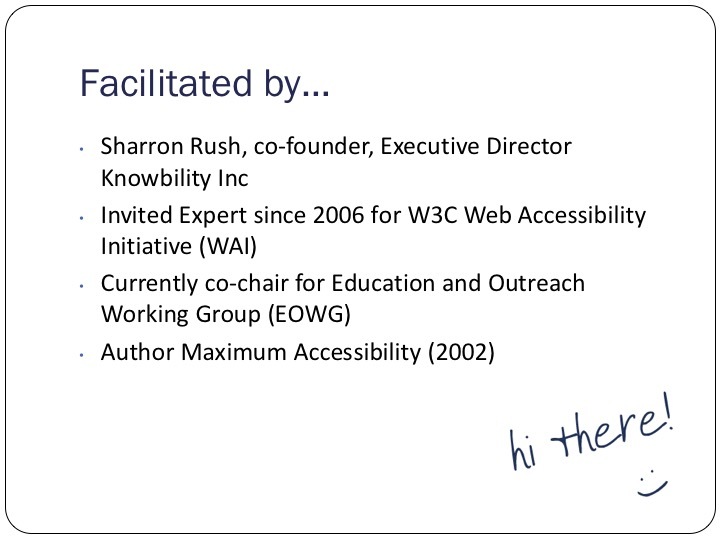 Sharron’s passionate about making the web accessible to everyone, and we’ve teamed up in this webinar to help you do the same for your audience. Going back to the roots, Sharron reminds us how central the ideas of accessibility and universality are to the formation of the internet. 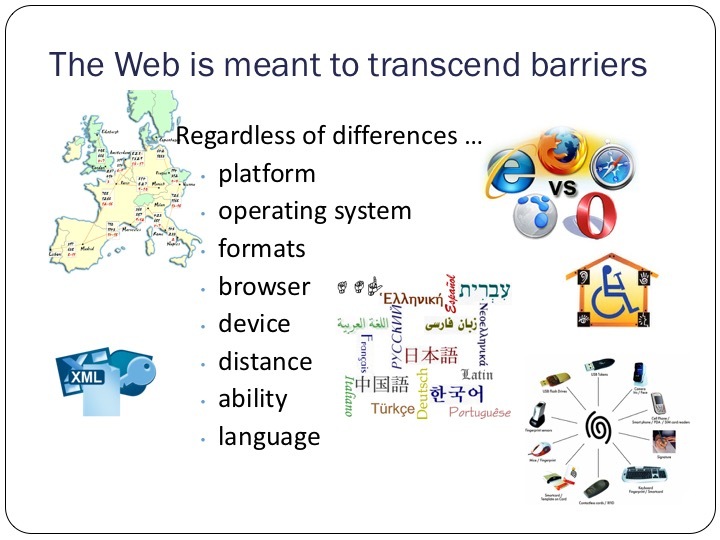 The internet transcends distance, language, class, and disabilities. It is a common platform that places all users on the same playing field, and accessibility design is core to making sure that happens. The W3C (World Wide Web consortium) is an international community that develops open standards to ensure the long-term growth and stability of the Web. 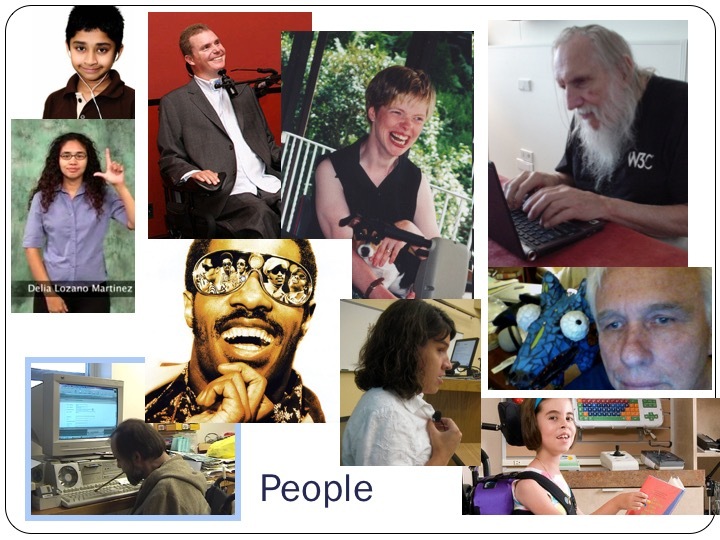 As part of their work, they also focus on creating and promoting accessibility standards ranging in application from content to dynamic applications. Rather than going to the technical specifications themselves, Sharron is here to help guide you through what can be an overwhelming amount of information. Legal Argument: UN Convention on the rights of people with disabilities. Access to communications and technology is a basic human right. Americans with Disabilities Act DOJ active & accepting complaints. Technical Argument: By creating accessible websites you’re building upon a responsive, adaptive platform that can serve you well in other areas. Market Argument: The market of people with disabilities is huge, and growing as the population ages. People with disabilities have a trillion dollar income, with 200b in discretionary income. Humanitarian Argument: You can reach brilliant, innovative users who would not be supported or realize their potential otherwise. Here are some short videos that really drive this point home. 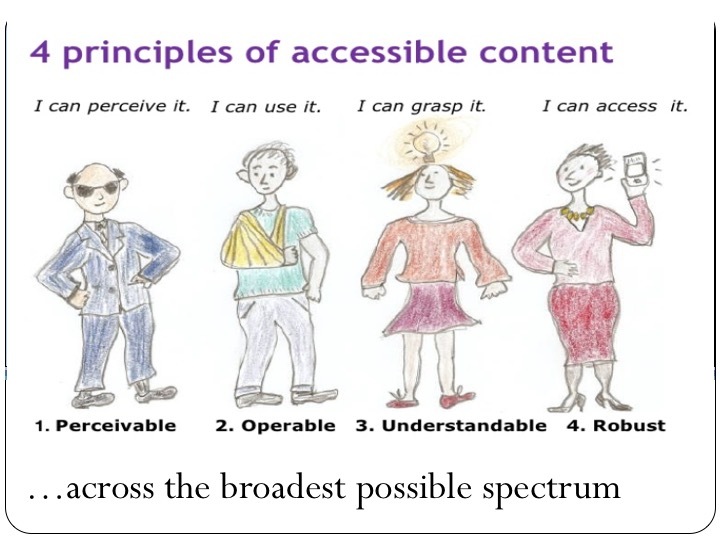 Rather than work through the long, overwhelming list of individual regulations, Sharron suggests learning and understanding the concepts of accessible content instead. Many web applications for accessibility rely on the underlying structure of your page to communicate its content. Headers, columns, form fields, etc. are all communicated semantically to the user. If you’re not using semantic structures to build your page, your content is not able to be communicated. 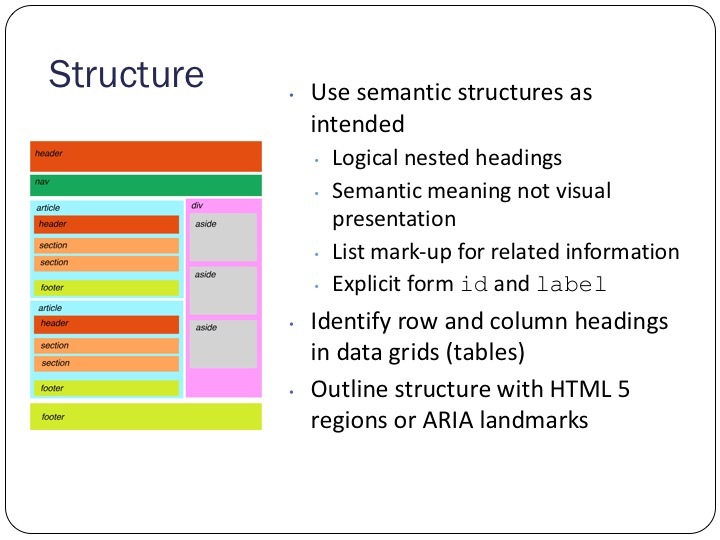 These semantic cues include everything from explicitly labeling your form fields to first outlining your page structure with HTML5 regions or ARIA landmarks to ensure the structure works correctly. As text readers work semantically through the page, the order your content is read makes a huge difference. Create a reader order that is reflected in code, including a logical tab order, and make sure that your page titles are meaning to help orient the user. Also, make sure alerts and error messages are called out with primacy, and able to be closed or minimized. Allow all functional elements to be reached and activated from the keyboard. Make keyboard focus as clearly visible as mouse hover states. Provide text alternative (alt attribute of img element) for meaningful images. Make sure that you’re tagging your images with functional descriptions, not literal ones, as the intent of the image may be different than the form. Also, allow readers to skip decorate images with empty alt attribute <alt=“”> tags. Also, and this is super important for data-related users, make sure you’re fully explaining any graphs and charts. 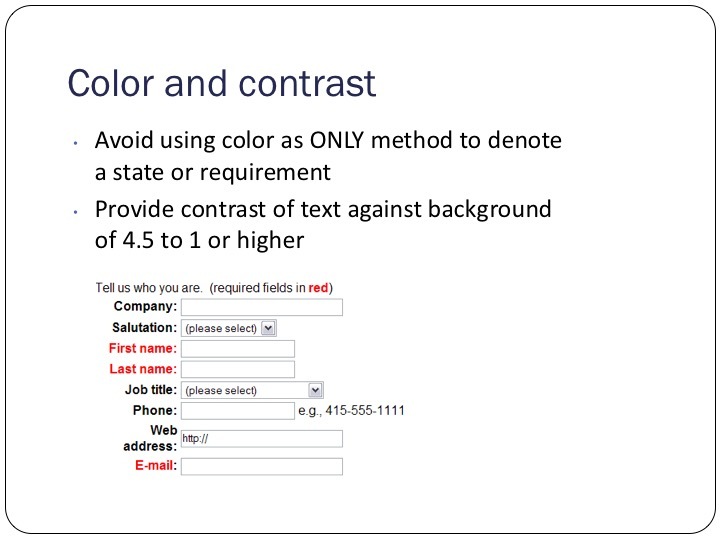 Avoid using color as ONLY method to denote a state or requirement.Make sure to provide contrast of text against background of 4.5 to 1 or higher for users with impaired vision. Make sure your media player controls are keyboard operable, and caption audio content of video and synchronize to onscreen actions. Describe meaningful video content in audio description track or text transcripts. After all of your hard work, how do you know if you got it right? Well, there are some easy checks you can run through to make sure. Go to: https://www.w3.org/WAI/eval/preliminary for checks related to all sorts of different parts of your website, from page title to multi-media alternatives. Finally, this last point cannot be stressed too much. Including people with disabilities into your user testing audience will rewards you over and over. You can reach out locally using disability organizations, or try remote testing through AccessWorks.